I’ve been on a bit of a comedy binge (insert gag here of your choice about my career) over the last year or so, having seen Frankie Boyle, Dara O’Briain, Russell Brand and Al Murray live amongst others, and really enjoyed most of them (although I was disappointed by Frankie, who had very little fresh material). A couple of weekends ago I had a total comedy binge, seeing John Bishop in Bournemouth on the Saturday and Al Murray (again) on the Sunday in a really compact venue at the Hammersmith Lyric in London. What a cracking weekend it was! Despite the venue being a bit odd (it’s usually a conference centre) and the staff being over attentive with their continuous announcements over the PA system in Bournemouth it was a really enjoyable night. John: Where are you from? John: Wythenshawe? It’s like what it would be if the cast of ‘My Big Fat Gypsy Wedding’ settled down somewhere! Not very politically correct, but very funny! 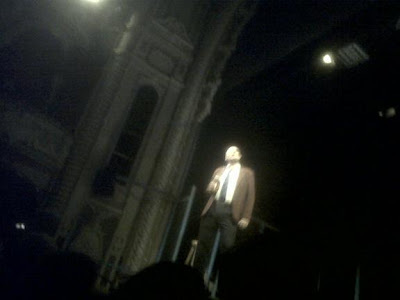 Sunday was Al Murray, headlining an event that had a few other comedians. Al, as you may know, is legendary for picking on people in the audience – and thankfully we were safe as we were in row G. Phew! Now I’m aware I’m a reasonably conspicuous person (and wearing a T-Shirt that just said ‘pancakes’ on it doesn’t help much), so we started preparing our stories for when he asked us what we do. Al: What do you do Alex? Me: I work for Richard Branson. Al: What do you do, do you blow up the balloons? Al: Any Virgin customers here, anyone got any problems? Alex can sort them out for you! Well, that was nice of him wasn’t it? Thankfully the responses were amusing and just to wind me up, as I didn’t have any business cards on me! It was another really good night and a great weekend of comedy, and I even got a tweet back from Al when I said I’d enjoyed having the mickey taken out of me! Being in a much smaller venue that was a lot more intimate than when I last saw him (at the Hammersmith Apollo) really made it a much more enjoyable night with the Pub Landlord – not that it wasn’t great first time! Who’s the best you’ve seen in the flesh?